At the northern edge of the Seven Kingdoms, there is the Wall. Built from massive blocks of ice and guarded by ancient, forgotten spells, it towers over 700 feet tall, forbidding entry to all who dwell beyond. A wall is only as strong as its defenders, and here, those defenders are the Night�s Watch. In the Night�s Watch, all men are brothers. Knights, lords, and the brothers of kings rub shoulders with slavers, murderers, and the scum of Westeros. Their task is grim and cold and thankless�no songs will ever be sung for them. Yet their vigilance is all that protects the southern lands from wildlings and the Others. 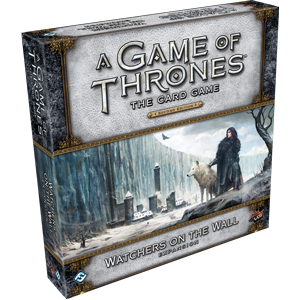 Travel north and join the Night�s Watch with the Watchers on the Wall deluxe expansion for A Game of Thrones: The Card Game! Within this expansion, the Night�s Watch explores new and existing themes, as you find new ways to defend the Wall, new ways to conscript your opponent�s characters, and plenty of rewards for focusing on the three branches of the Night�s Watch: Rangers, Stewards, and Builders. Along with the nameless men who swell the ranks of the Night�s Watch, you�ll find new versions of iconic characters from throughout the saga, including Jon Snow, Old Bear Mormont, Maester Aemon, and Samwell Tarly. And although the focus of this expansion rests on the Night�s Watch, you�ll find two new non-loyal cards for every other faction, expanding your options for any alliance. You�ll also receive an assortment of neutral cards portraying the Night�s Watch�s most common enemies, the Wildlings. With seven new plots (one loyal to the Night�s Watch) rounding out the expansion, Watchers on the Wall offers new pathways to victory for every deck.